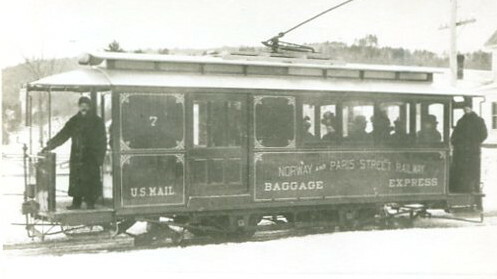 The Norway – Paris Street Railway, which had the distinction of being Maine’s shortest trolley line, operated between 1895 and 1918. The 2.1 mile route ran from the head of Main Street in Norway to Market Square in South Paris, taking fifteen minutes to complete a one-way trip. The fare was five cents. 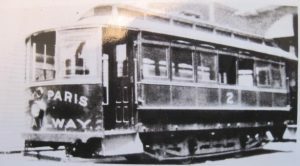 The trolley company was formed in 1893; directors included prominent Norway citizens George L. Beal and Freeland Howe, as well as businessmen involved in trolley companies in other Maine towns. 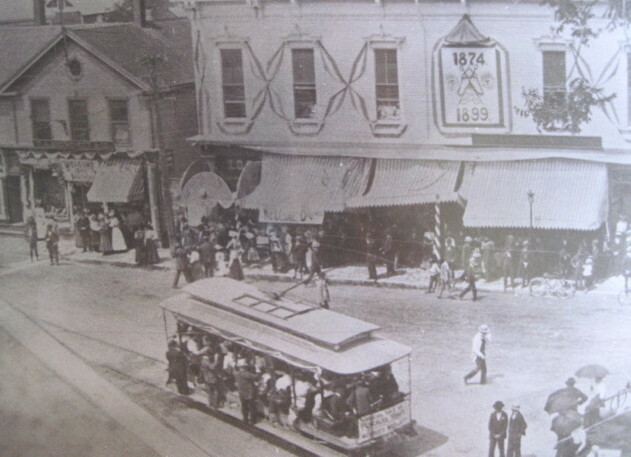 Construction of the line began in the spring of 1895 and regular service started July 1, 1895. Four cars, two open and two closed, were initially purchased. 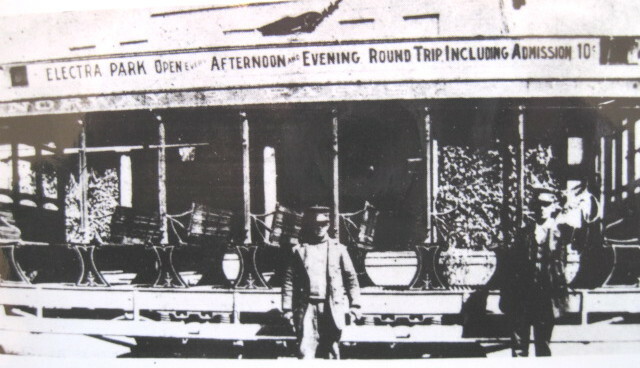 Normally, only one car was used at a time, but others were put into service when passenger traffic was heavy, such as during the county fair. 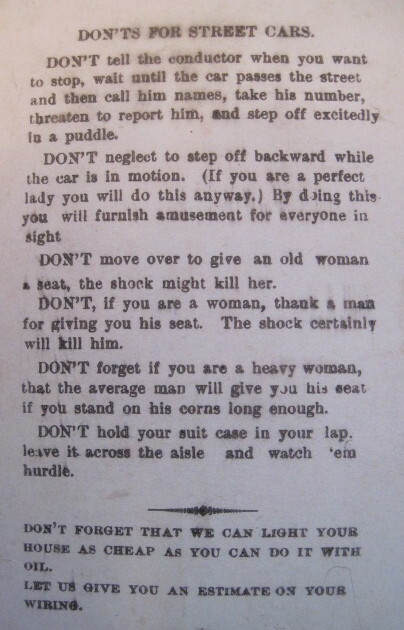 In later years, a third closed car and a combination passenger/baggage car were acquired. 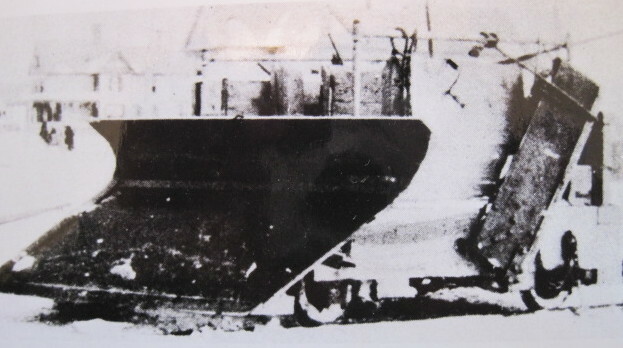 During the winter, the track was kept clear by a home-built snowplow on a wheeled car that was pushed by the trolley. The plow could be troublesome, frequently catching a plow edge and derailing the car. The enterprise was never very profitable and some years lost money. 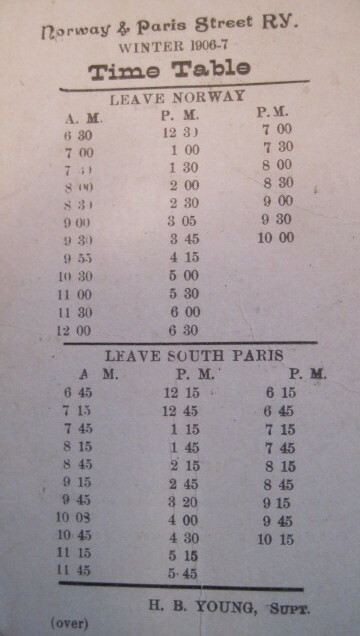 The relatively small populations of Norway and South Paris limited the number of potential customers and the advent of the automobile must have further decreased the number of passengers. During the winter of 1917/1918, snow was so frequent and heavy the tracks could not be kept clear, so service ceased for the winter, resuming in spring. By mid-1918, the decision was made to discontinue the unprofitable venture. 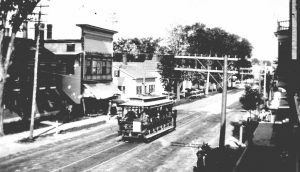 On October 5, 1918, the trolley made its last run. In 1919, the tracks and overhead wires were removed and almost all traces of the Norway-Paris Street Railway disappeared. One of the car barns is still standing, at the back of The Norway Brewing Company on Main Street. An open car advertising Electra Park in South Paris. The park was built by the railway company to increase ridership. It featured an outdoor theater that seated several hundred, a croquet field, refreshment stands and other attractions. Electra Park was located where the Save-A-Lot shopping center is today.